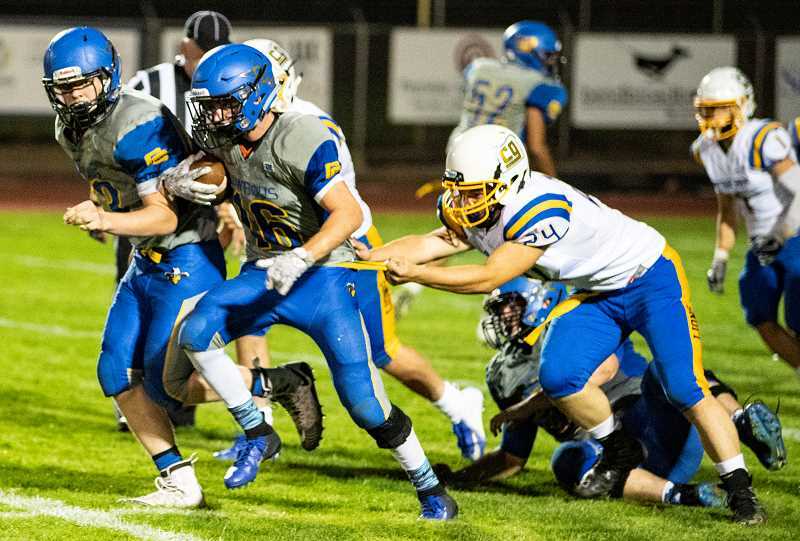 The Cottage Grove Lions took advantage of a series of early Crook County mistakes to jump out to a big early lead then rolled to a 28-7 victory over the Cowboys in Prineville Friday night. The Lions showed why they are ranked No. 1 in the latest 4A coaches' poll as they scored on their first two possessions, jetting out to a 14-0 first-quarter lead. "We were undisciplined in a lot of aspects," said Crook County head coach Ryan Cochran, following the game. "Playing a good football team, you can't do that and expect to be in the game." Cottage Grove took the opening kickoff and scored four plays later as Dylan Graves hit Matt Zumwalt on a 45-yard touchdown strike. Erick Griffen's kick was good, and the Lions led 7-0 less than three minutes into the contest. On their opening possession, the Cowboys went on an 11-play drive but were unable to score. Crook County appeared to get a first down on a face mask call, but instead found the penalty being marked off from far behind where the ball ended up. Then on fourth and five from the Cottage Grove 27-yard line, the Cowboys once again appeared to earn a first down, only to fumble the ball. 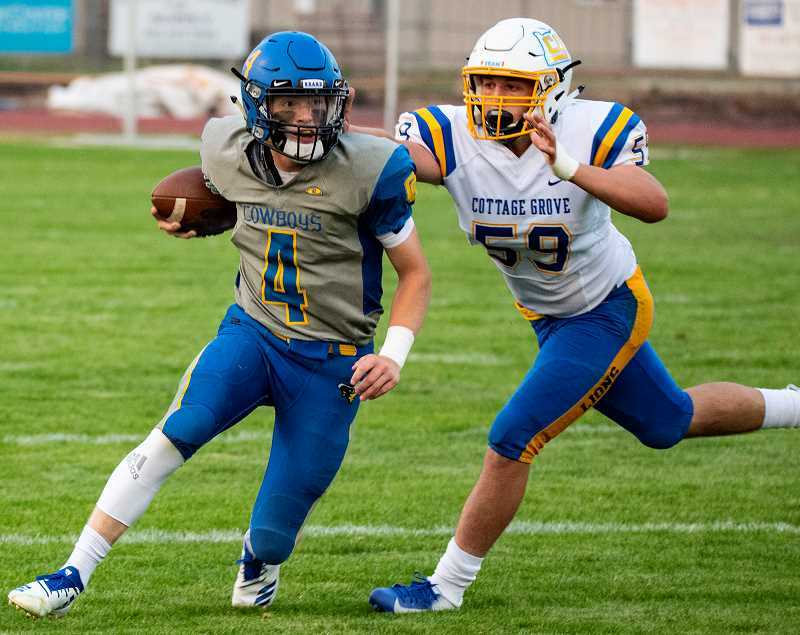 Cottage Grove recovered on their own 22, then aided by three Crook County penalties, the Lions quickly scored again, this time on a 14-yard pass from Graves to Griffen. Once again, Griffen's kick was good, and the Lions were roaring. On their second possession, the Cowboys moved the ball to the Cottage Grove 45-yard line before their drive stalled. On fourth and three, the Cowboys attempted a screen pass, but couldn't connect on the pass, and Cottage Grove took over on downs. Once again, the Lions quickly scored, as Graves hit Griffen for an 8-yard touchdown pass. Griffen's kick was good, and Cottage Grove led 21-0 with 9:35 remaining in the half. The only electricity of the night for the Cowboys occurred on the next possession, when Brody Connell hit Dominic Langley down the left sideline for an 87-yard touchdown strike. Connell's kick was good, and the Cowboys were back in the game, trailing 21-7 with 8:52 left in the first half. Both teams had chances to score the remainder of the half, but each had a drive stall. Then, on the final play of the first half, with the clock already reading zero, Graves hit Zumwalt with a 17-yard touchdown strike. Griffen kicked the extra point, and the half ended with the Lions up 28-7. After the heartbreaking last second score, the Cowboys could have folded, but that's not what happened. Instead, the team came out in the second half and played inspired defense. Although both teams were able to move the ball in the second half, neither was able to find a way to score. "Obviously, it was frustrating in the fact that in the first half we had some alignment issues, some discipline issues and a lot of those types of things and dug ourselves a pretty big hole," Cochran said. "But on the other hand, they are a good football team, and if we do some things differently, it's a lot different margin in that football game, so there are some things to be encouraged about. If we clean up that garbage so that we don't give them so much free yardage and are getting lined up correctly and not giving up those bigger plays, it could have been a different ballgame." Not only did the Cowboys give up some big plays, they also finished the game with 125 yards of penalties, with many of those penalties coming at the most inopportune times. Cottage Grove amassed 400 yards of total offense to 278 yards for the Cowboys. The Lions had a balanced attack with 132 yards rushing and 254 through the air. Meanwhile, the Cowboys had 161 yards on the ground and 117 passing. Connell was 2 -for-8 passing for the Cowboys with both passes caught by Dominic Langley. Kaden Horton led the Cowboy rushing attack with 70 yards on eight carries. Clayton Berman added 47 yards on seven carries, while Connell ran for 37 yards on five carries, and Kyle Knudtson carried the ball 10 times for 31 yards. The Cowboys converted on 5-of-11 third-down attempts, while Cottage Grove was successful on 5-of-10. Both teams finished with 24 first downs, while Cottage Grove had four turnovers to two for the Cowboys. However, Cottage Grove was able to sack Connell six times for minus 57 yards, while Crook County could only get to Graves twice for minus 17 yards. "Cottage Grove brought pressure," Cochran said. "A lot of blitzing, and we didn't always handle that and pick up the right people." He added that several times the Cowboys were able to drive from deep in their own territory to midfield only to see their drives stall. "We got the ball out fine until we got to the midfield and then stuttered," he said. "We ended up with penalties or some big sacks that put us behind the chains a lot of the night." Berman led the Cowboy defense with six tackles, while Erick Gonzalez added five. Carson Smith finished with four tackles and one assist. Ethan Cossett had four tackles and two assists, while Jason Slawter finished with three tackles and five assists. Following the end of the game, Crook County tackle Caleb Parrott took the Cowboys aside and talked to them quickly before the coaches arrived. "I said that I thought we all played with great effort," he said. "Some of the best effort I have seen since I've been here. I told them to remember the feeling of tonight and be hungry. Let it bite a little bit, but not too much. Just enough to be hungry for the next week of practice." Once the CCHS coaching staff reached the team huddle, they also applauded the Cowboys' second half effort. "I will never question your effort," Cochran told his team. "Not one person gave in, but the big thing tonight was discipline. The second half we cleaned up some things, but we have some things to work on discipline wise if we want to be a good football team." "We played with amazing effort," he said. "Now we just need to be disciplined on both sides of the ball, and I think we can do great things. We get better every time we practice. It hurts to lose, but now we know what we are capable of." The Cowboys (1-1) play at Sisters next week, while the Lions (2-0) are at home against Stayton. Both games are scheduled to begin at 7 p.m.
"I think for us getting ready for Sisters is about cleaning up ourselves," Cochran said. "It's worrying about us. Getting our alignment and assignments down and being able to adjust to different fronts and be lined up so that our coverage is right." Cochran added that he is pleased both with the effort that the team showed in the second half of Friday's game and with the attitude he is seeing from players following the loss. "I was really proud of our effort of our guys not giving up," he said. "Coming out in the second half and not giving up any more points was a big testament to our kids, and I was really proud of how they are already talking about getting better. I went down to the stadium on Saturday, and there were a couple of them down there working out throwing balls to each other. So to see us come off a loss like that in our home opener and then responding the way they are responding, I'm pretty excited about that."